This entry was posted on Tuesday, September 7th, 2010 at 12:00 am	and is filed under Comic. You can follow any responses to this entry through the RSS 2.0 feed. You can leave a response, or trackback from your own site. Hmmm. "Flat spin." Tom WILL lose the dogfight but still may win the war. Lorraine's smart. If she's talked to her bosses at CognoTek and gotten them linked in on the dogfight. "His physics are "THAT accurate??? [astonished looks]" he's got a job. And Lorraine, as referee, may well decide HE won the dogfight's real purpose: testing the sim. I think you might be on to something. Still, I would like to see Tom win it "honestly." I do not mind an exploit, but changing the definition of winning strikes me as invalidating the whole purpose of the contest, for Tom to prove his manliness and get back at his jackass boss. Good point. But I'll be durned if I know how the jaws of defeat can be muzzled here. *sigh* three pages to go. Well, there are a lot of bullets flying to literally chew the SPAD's tail off, and WW1 fighters didn't carry massive amounts of ammunition. The Red Baron was a mediocre pilot but an excellent shot - it'd be amusing if Kelso turned out to be his antithesis in this regard and blew his load without rendering the SPAD completely unflyable. Now, flying without a rudder isn't likely to be fun (especially when he's already in a flat spin), but if Tom is still flying when Kelso is out of ammunition...well, he's probably not going to bring Kelso down, but forcing a draw could be viewed as a moral victory for the less experienced pilot. The gripping hand, though, is that whatever happens in the coming weekend, it's Lorraine's choice what happens afterwards. Yeah, if poor Tom were up against the real Red Baron he'd likely end with bullets through his own body, rather than his plane, without ever even seeing his opponent. Richthofen preferred to aim for the person rather than the plane. One of his basic rules was "Aim for the man and don't miss him." Although the Red Baron "was not a spectacular or acrobatic pilot", I'm not sure it's fair to call him a mediocre one. But he did think of his aircraft as a gun platform, and his strengths were in marksmanship and tactics. I'll give you odds on that Kelso jams his MG. He can't win, remember the first page? It cut to a flashback when he was about six feet from the ground. I think one of two things'll happen, as was said, he'll "lose" the dogfight, but win in that he'll get hired for a better job, or he'll lose, go on the trip to Aspen, and surprise, there's Lorraine, saying that the "Interview" she had didn't take that long. Tom's already won. He's been winning ever since somewhere around page four in the comic, where "Mr. Kelso" first decided that the best way to impress Lorraine was to use his position of authority to attempt to bully his rival for her attentions into backing off. And Kelso never /stopped/ bullying, either - he deliberately declared a contest where he had every possible advantage. It's like Arnold Schwarzenegger challenging Stephen Hawking to a contest to determine who's the better man and choosing arm-wrestling as the mode of combat. Also, when a master finds himself in a challenge contest against a rank amateur, there are two ways they can choose to fight: they can make it a good contest and limit themselves to only slightly over what they think the amateur can handle, to push the challenger to exceeding his own limits and allowing him to lose with a modicum of dignity after having put on a good show... Or they can violently slam their opponent into the ground repeatedly at earliest opportunity just so everyone will see how big a badass they are. One is the mark of a gracious victor. The other is the sign of a smug bully. It's not at all surprising to see what Mr. Kelso chose, but it doesn't make him any better of a human being. When it came out that the CEO is an accomplished pilot, whereas Zapopolis has only played computer flight simulators, it occurred to me that we might be setting Zapopolis up for a dilemna: lose by fighting fairly, or win by exploiting a bug in the program. In the latter case, he'd lose overall. Of course, what he claims to have accomplished with the software already is a masterpiece of engineering, so he should have already won, in that sense. Easy... Too easy, even. I get the feeling all is not legitimate amongst the physics today. Tom really does not have confidence in his own piloting, nor a large bag of tricks to use. Could the interface note things like The Right Stuff guy used: finger or thumb to block the sun so that you can see what is coming? I thought that one person had said that the Spad had the better engine, so why is it like an elephant to climb? But Tom does not have the skills it seems. The Triplane is very light and has better power-to-weight. Its advantages are initial climb rate and turning ability - it's short-coupled and very manoeuverable. A good choice for an aerobatic pilot. Not to mention the fact that it has a third more wing area, which also reduces wing loading. I don't know how accurate it was, but I remember in the old WWI dogfighting computer game "Wings", the triplanes would indeed climb like crazy compared to your poor biplane. I think there is only one way for Zorro aka Tom to fight Kelso: Hit and run. engine and its low speed: 160 km/h vs 220 km/h. of trying to get in his back, fly away in the opposite direction. position you want to have the Dr I. > Truth is, That Spad XIII would eat that Fokker DR I alive! Tom just fell for one of the oldest tricks in the book, but then he didn't know any better. Still he has shown his simulation works. I vote we should be giving the writers Artistic License on some details, everyone nit picking caliber of weapon or wind speed is not hindering a great story. Truth is, That Spad XIII would eat that Fokker DR I alive! The Germans knew this as they only built 300 of that design before moving on to better aircraft. If anyone has actually read "A Duel over the Somme" they know it culminates with two opposing pilots being shot down and sharing a strange moment of friendship and peace with each other amidst their crashed planes. Even if Tom loses completely, I'm still looking forward to Kelso being 'shot down' by Lorraine. And more to the point, she's been nothing but manipulative in this, her interests are her own (her work) and not either of theirs. Neither of them will win the Battle for Lorraine. This battle is taking place over the Somme on 4 April 1918. The "Red Baron" was killed on 18 April 1918 over the Somme, quite possibly by ground fire as he pursued his 81st kill too close to the ground. Tom is going down, but so could his over eager opponent. Kelso, you fell for rope-a-dope? Didn't you even skim Robert Shaw's book? Ha ha ha! I took back what I said about cliche. 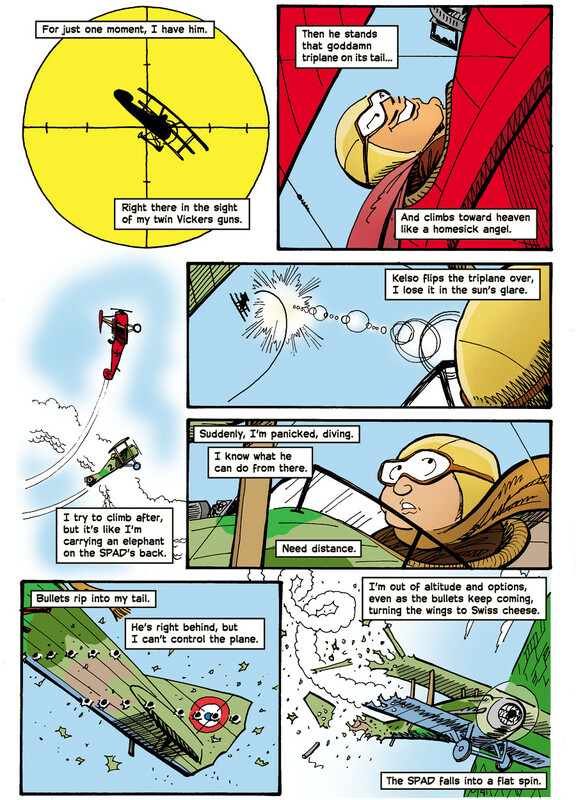 Contrary to what I was expecting, this comic has the guy who is an experienced stunt pilot actually beating the computer programmer who's never flown in an actual biplane before. Zapopolis blundered right in to an obvious feint and got creamed for it. Yeah, i'm kind of surprised that Zapopolis tried to follow the climb, since he would have to have known that the triplane was so much better at climbing. He should have turned where he was and circled around so that when kelso come back down he wouldn't be in the sun. Kelso would still be diving of course, but he wouldn't be on Zapopolis's tail. Well, no, you probably won't want to be in a flat circle with the guy above you. He can roll his aircraft while it's pointing straight up and then hi yo-yo you. Zorro needs to boom and zoom Kelso to death, which means he needs to use his superior speed and sustained climb to get above him and then dive down and through Kelso. Zorro should probably have blown through the merge when his shot disappeared and dove out, starting a climb when outside Kelso's range. My aerial tactics knowledge is mostly from WW2 era, but here's my tuppence anyway. The Fokker triplane was extremely manoeuvrable, so Kelso can basically point his guns wherever he wants to as long as he's still moving forwards. What it can't do is go fast (because it's very draggy) or sustain a sharp climb (because the engine isn't very powerful). The SPAD is rather different. It won't change direction as easily as the Fokker, but it has a speed and power advantage. Unfortunately going faster can easily translate ito going *too* fast, aggravating the difficulty of turning - and this is what's probably happened to Zorro here. 1) Keep going. This is a bad idea, as Kelso can push out of the climb, trade his altitude back for speed, and get on his tail. 2) Dive. This would put some distance between them, allowing Zorro time to come around for another pass. 3) Turn in a level circle, as someone suggested. This prevents Kelso from automatically getting on his tail, and the fight will still depend on relative skill. 4) Climb with him, and try to out-climb him. I don't know enough about these machines to know who would stall first - but in a vertical climb fight, the first one to stall or to break out into a dive loses. Zorro chickened out, and is now paying the price. I believe Zorro was coming in fast for an attack run, which exaggerated the SPAD's turn radius - hence the "elephant" comment. Since he was used to the less powerful VII model, he wouldn't have encountered this higher speed before. However, the extra speed should have worked to his advantage in the climbing duel, as he had more energy to begin with. He just failed to use it. In fact, looking at this again, I see that Kelso actually did turn back down first. Zorro then turned down... while still *below* him. This automatically put Kelso on his tail. The alternative of staying in the climb a bit longer would have made it a more even match. He got in that situation trying to pull lead on Kelso as he looped upwards, blowing all his energy pulling too hard into "G" hence the Elephant remark. For flavor imagine the sound that Spad was making with all the wires and struts straining and stretching, and the hammering of Zorro's heart in his ears as he nearly blacks out from the "G"s. That sound would be terrifying to a pilot of that time, pull way to hard in some aircraft of WW1 (Such as the Dr-1) and the wings rip right off, game over, No Parachutes! Yea, Lemming said it, a Rope-a-Dope, straight out of Robert Shaw's book. He should have eased pressure and zoom climbed above Kelso, his speed would have taken him out of gun range and then Kelso would have to deal with him diving on him. Ok some 'votes' for spad should have outclimbed, some otherwise. While we are nitpicking, as all web audiences do, was that smoke trail characteristic of a flat spin? In a flat spin, one wing has lost lift through too high an angle of attack, and the other one is still flying and pulling the plane around in the tight spiral that keeps the low wing stalled. With half his right wings and most of his tail physically missing, there's no way he can recover. Oh, and the "smoke" may be coolant and/or lubricants (many aero engines use the same fluid circuit for both jobs) leaking from the engine. There were quite a few instances of aircraft in WW2 that were physically very tough, but had a vulnerable radiator somewhere which could cripple the engine. WW1 aircraft had enough trouble just flying, so no armour anywhere.